There was a time once when I believed a wildlife photo was supposed to be, and I know this sounds a little naive and idealistic, of a wild animal. I was amazed at every good wildlife shot I saw and anxious to extend my praise. I marvelled at each photographer’s prowess and happily allowed myself to be taken away vicariously to an incredible natural moment. How did they get all those one in a million shots? Was it possible that someday it would happen to me? Naturally beautiful and wild – not baited. But slowly I began to sour on some of those photos when I learned the untold back stories. It felt like my innocence was slipping away forever. Why did some wildlife photographers seem to have trouble with the wild part? I found out about game farms that rent animal models by the hour. People shot animals in zoos. And even an international competition for Wildlife Photographer of the Year allowed bait as long as it was dead. My goodness these apparently natural photos were getting stuffed full of some rather unnatural stuff. Yet I rarely saw an asterisk anywhere that added, “Taken out of cage to perform” or “baited” or “artistic rendition of scene.” Usually they were presented as natural wildlife scenes. Or was I being too rigid in my thinking? My journey to decide what to make of all this was strongly influenced by wildlife photographers like John Marriott, Tom Mengalson, Melissa Groo and Tin Man. Without adding up all the potential harm to animals (no small thing), I tried to imagine what it would be like to add the unnatural to my photos. After all, isn’t it all perfectly legal? The idea of getting some fantastic birds of prey shots with a little bait help seemed theoretically tempting. If so many people were doing it, then it must be OK – that’s how it works on the Internet right? But then I imagined following through with the idea of publicly posting those photos. I could say what I did to get the photo which felt like placing a red flag on it and putting it in a questionable category. Or I could say nothing. But as Tin Man pointed out, one day some wide-eyed kid might ask how I got that shot and wonder why I pretended it was a natural moment. That’s a conversation where passion for wildlife photography goes to die! And therein lies a fundamental problem. While there are many factors in play, when I see a wildlife shot I want to believe I am seeing a wild animal in a wild moment. When the untold truth gets a lot more complicated than that, I feel deceived. That’s not what I want to do to others. I understand my opinion has its detractors and downsides. Olympic runner Ben Johnson once described not taking steroids as lining up one yard back at the start of the race since everyone else was taking them. Some days that’s how I feel. Every decision has a consequence. And so my mouse continues to hover over the amazing photo. It’s not a question of beauty. It’s a question of trust. Is the photo what it appears to claim? Lovely photos, Lyle! To me, “wildlife” means wild animals. Other photos should be tagged “zoo” or similar. Glad you enjoyed the photos. Yes it seems a little tagging would go a long way! Great story and I liked your response. There are divergent opinions out there and some just leave me shaking my head. I remember that shock, too, when I realized that a lot of wildlife photos were taken of creatures in captivity. It’s a bit like walking around a garden, taking photos of the flowers and pretending like you took the photo in its natural habitat. I don’t have anything against taking photos of captive animals, of course – they already exist in zoos and refuges (so it’s not like people necessarily capture them just to take a photo) and sharing photos of them might help raise awareness of biodiversity and conservation efforts. But as you say – it’s about honesty. And honestly, I did not know that photographers “rent” subjects for their photos. Beautiful photos, once again – thanks for sharing them, and your thoughts! I’m glad you enjoyed the post. There are so many issues and opinions on this matter I certainly couldn’t cover them all. I have seen photos and TV shows about wildlife rehab that were most encouraging. As long as people don’t drift away from the expectations of the audience it stays on the right track. In other words be honest. 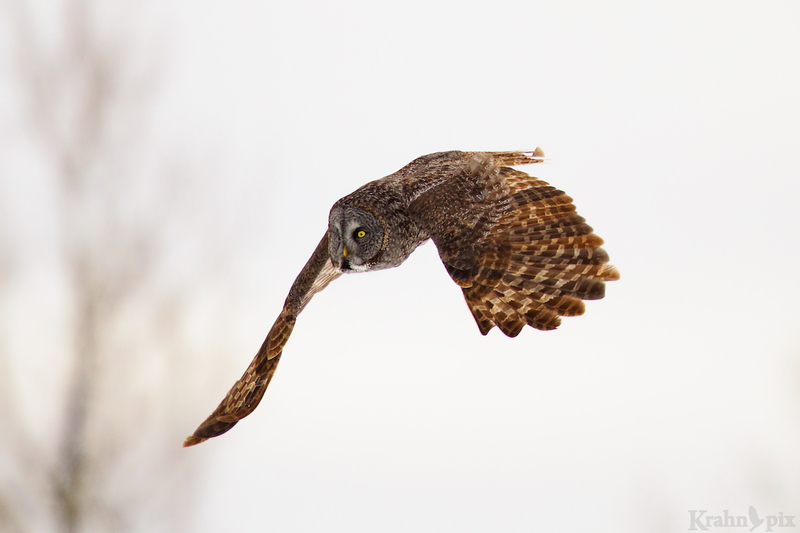 Lyle, great owl shots. My wife, Barb and I have been photographing the wild for several decades now and decided a long time ago that honesty is the best policy. We don’t make images of captive critters unless there is a compelling reason…rehab or other. Finding beauty and capturing that essence in a zoo or other captive situation is great, we see no problem with that (depending on why some living thing is captive), just make that info available. As to baiting or calling in birds or animals, we say no. Too much stress on the creature, life is hard out there, no need to make something burn up calories just so you can get an image that would be difficult any other way. We do have bird feeders, hummingbird feeders and nest boxes scattered around our place (the feeders come in a night in the summer so the bears don’t get too friendly) and while we do photograph those birds that are attracted to all of that, no one is keeping them here. Part of the joy of getting that special shot is because it can be a challenge (digital cameras, fast autofocus,incredible lens resolution make it all so much easier than in the bad old days of film) and being out there is the most important part of wildlife photography. Keep shooting and loving what’s out there. I appreciate that sound advice from people who have been doing photography for decades. It sounds like you have a good balance of how to deal with the challenges while enjoying and respecting wildlife. Your comment about the bad old days reminds me of cautiously going digital thinking I’d try it and never shooting a roll of film again. Yet even with all that advancement I can still find challenges. But that is part of the fun and the satisfying feeling of capturing photos like these owls. The owls here are so elusive. I hear more than ever see them. Love these shots of yours. So magnificent. It is one od my Spirit animals and yet I have yet to get a good photo. Love your work. It is amazing. Thanks so much. It took a long time to the owl shots I wanted. Maybe that’s why I value them so much. Such amazing creatures. There is a lot better feeling of capturing the creatures in the wild. I love those lazy days you describe when the wildlife is posing. Pelicans and herons make for wonderful photos. Beautiful owl photos, Lyle! The extent of my “wildlife photography”, such that it is, is on the order of capturing gopher holes, nutria, skunks or deer passing through the farm (or taking over my tool shed), or honeybees pollinating fruit trees and flowers. I have a lot of respect for individuals like yourself who take amazing shots of very active, mobile wildlife, sometimes in far away places. I’m glad you liked my owl shots – those two are among my all-time favourites. The animals passing through your farm are all interesting creatures to photograph as well. I still want to see a nutria some day and I have only had one opportunity with a skunk so far. Yes that could be dangerous! Lyle we have talked lots in the past in forums and in private chat and I agree . I set seed out for the birds in our park at the local feeding station only because the birds have become dependant on the source but it doesn’t stop at a handful of seed I pay out of my own pocket and buy 3 to 400 pounds of seed each winter in fear out little feathered friends will parish if I stopped . So here I am a bit of a hypocrite because I don’t believe in taking pictures of baited raptors like you have said it takes away from the nature of the true Nature shot . I know this is a very tuff thing but pay your dues and put in the time it takes to get an owl catching a wild mouse and then and only then be proud of the lengths you went to get the shot . Good to chat with you again and thanks for joining the conversation. It sure seems a lot more satisfying to me to photograph a raptor catching a wild mouse rather than some staged setup. And it sure isn’t easy but that’s part of what makes it special. The whole issue can get more complicated if you dive into the details. To be perfectly consistent with the no baiting position, it would include seeds for birds in the backyard. I haven’t thought a lot about that area but somehow it seems different – not sure why. Something to think about it. Wow, I’d never even considered that this was going on. I wonder if I can rent out my Ali Baba the alligator. 🙂 Great owl captures, Lyle. Thanks. Those owls were kind to me. I agree with what you say Lyle . Forgetting whether baiting is an acceptable photographic technique it is terrible from a wildlife management point of view. Maybe the ways to lure wildlife for photos should follow the same rules as those for hunting. They are very similar activities, just with very different outcomes. Having said that (while I’ve yet to do it) I don’t see any harm is setting out seeds or nuts to lure the wildlife in my suburban backyard for a photo op. I guess that makes me a hypocrite. Along a similar vein I remember before I started shooting macros I read an article about some macro photographers were very upset with some macro insect photos showing up in blogs and on forums. They were gorgeous photos with excellent lighting, exposure, and focus. Also the compositions were well thought out and the insects were caught in dramatic poses. Turns out the photographers were killing the insects and using wire to pose them in dramatic and sometimes impossible poses, the latter helping to bring the issue to light. The whole issue can get more complicated you dive into the details. I was surprised to learn that hunters are allowed to use bait in our province. To be perfectly consistent with the no baiting position, it would include seeds for birds in the backyard. I haven’t thought a lot about that area but somehow it seems different – not sure why. Something to think about it. No easy answers for this one. If I see an image I love, I’m curious as to how it was created. I agree that I can be disappointed if I find it’s been taken at some zoo, or other ‘cheating’ sort of situation, but sometimes the image itself can have a positive quality to it regardless. I remember this same sort of discussion coming up about whether someone used post processing to create a particular image, or not. That particular controversy seems to have calmed down some now that most folks realize that the camera doesn’t always capture the scene exactly as the human eye sees it no matter the technical perfection involved. Here’s what I consider to be a perfect example of the ‘mystery’ of capture: https://youtu.be/nA3LtXnNIto I am gob-smacked at the beauty and perfection to be found in this video, but then I’m not sure I want to find out exactly HOW they managed to capture these scenes. I’m afraid that it would spoil the magic somehow. I am gobsmacked by that video as well! Amazing stuff. And I completely agree that if they used some untoward methods it would definitely take away some of the magic of it. I guess that’s the point I was trying to make – I don’t want to be disappointed by the truth. So there you go. I guess even a semi-cynical person like me can still be idealistic enough to believe that people can make magical wildlife imagery in a way that doesn’t disappoint. Excellent conversation — I’ve witnessed firsthand some sad, ill-fated attempts at “baiting” in my hiking / photog excursions. Especially with inexperienced photogs and those who simply don’t respect nature. It’s all very sad for the wildlife involved, and ignorant all the way ’round — at least from what I observed the few times I unfortunately stumbled upon it; putting the wildlife actually at HARM (and even endangered nesting scenarios and the like). Just to get “that good shot.” Ironic! But I realize it’s a complex issue, so thanks so much for raising it! Yes there’s lots of irony to go around sometimes. Misplaced passion can be a dangerous thing – too bad about the bad experiences you witnessed.. My own views continue to evolve as I grapple with some of these things and I thot it would be interesting to see what response I got on this on. Thanks for joining in. I have never heard of renting wild animals. That seems very wrong. I have to admit that I have thought about baiting. Once a caribou was hit by a car near my house and in one day we saw lynx, wolves, bald eagles and golden eagles on the carcass. I seriously thought about buying a pig and killing it in my front yard so I could take photos of all the animals eating on it. Of course a keen observer might have wondered why a bear was eating a pig. That’s funny. Trust you to add some levity. That’s a picture that might be hard to get out of my mind. Great thinking, I love to see stories of how a photo took weeks of stalking to perfect, but then I also love the opportunity of seeing animals “in the flesh” in a short holiday I can take from work. Your debate is more about the integrity of presenting an image out of context, but I think the same principle can apply on different levels! Love your photos! It’s funny how it works. Sometimes I can go for a long time and not get anything and other times the stars align and it all comes together quickly. I’m glad you enjoyed the post. My thinking in these areas continues to evolve. It seems there are a few ways to get the results though some are easier to explain. I didn’t even know that’s how they got some of those shots. Would rather see natural, or explanation. Yes it’s amazing what a person discovers if you start digging around. Natural and honest are usually better ways to go in many areas of life. i know of two bird photographers who mention ” not baited”..in their work (Feathered Photography and On the Wing Photography-both outstanding) and others who admit to cropping or severely cropping. While I do take a lot of photos near feeders I try to capture birds on a branch on the way to the food. Sometimes I am lucky to get them “as is” but living in the city there is always a feeder nearby, human or otherwise.As for animals the captures are usually in a national park, often somewhat habituated to humans, unless in the back country. i hate to think of all the photographers “chasing ” the animals to get that shot, so maybe there is a place for farms, etc.. I have seen a few photographers who indicate their photos are not baited. Who knows maybe it will become a trend. Those two sites you mentioned look really good. I don’t have any issues with photographers cropping photos, in fact I think it should be encouraged – it’s all part of the digital process. If you’re interested, I explain more in my post – are my photos real which you can find here https://krahnpix.com/wild-photos-and-the-tales-they-tell/. Yes unfortunately we sometimes even have to ask what words like ‘real’ mean when people attach some rather bizarre meanings. I wonder what a fake would have looked like? Only the photographer knows for sure. I am so happy to discover I am not the only one who questions what they are doing. That’s me! I’m usually a lot better with the questions than the answers. I think your steroid analogy hit it right on the nose – baiting wildlife or photographing captive subjects may get you “the shot”, but we all know it’s misleading and deceptive unless you’re upfront about the circumstances under which the photo was made. Ethics are important to all of the photographers that I admire and look up to, you being one of them. I really appreciate your comments. I have often found it fascinating how consistently being honest can be helpful to a person in so many areas in life. Ethics matter as you say. I am totally with you, Lyle. Wild should be wild and if not it should be stated clearly.. Someone told me once that they weren’t cynical, just experienced. I think that describes my attitude exactly when I see the owl photos you described. I enjoyed the link you provided – it’s good to keep people honest. I guess the the rhetorical question is – if there’s nothing wrong with all these unnatural activities, why the reluctance to spell it out? You’re raising a question which would probably have as many answers as there are wild life photographers in the world? Fortunately I’m not a ‘wild life photographer’, or am I? After all I do photograph birds in the wild, allthough they often live together with humans (as the Black bears of Canda do?) Sometimes they rest on a lake, getting nothing from me. In other situations they might sit on a branch in my garden, because there is food to be found there. The next week they might be sitting on the very same branch, even when there’s no food at all there? I think – and that’s just me – if it looks a 100% natural, it’s OK with me. (Why spoil it?) Yes, I know some butterflies are photographed in a lab, but looking a 100% natural it will give me the pleasure of studying the details I’ll otherwise miss out on. I really don’t mind! You’re certainly right about diversity of opinions and I’m glad you shared yours even if you disagree with me. In my world, if you take photos of wildlife then you’re a wildlife photographer. Congrats on making the club! There is a lot of interaction between humans and wildlife which often makes things complicated. With less wild places the interaction seems to increase. When the black bears and humans in Canada mix too much it gets even more complicated. You obviously enjoy wildlife and photos of them and that’s something we share. I agree with that. In my mind, natural still has a broad definition and it’s perfectly natural for some wild animals to be close to humans and their structures. Barn owls live in barns and hawks are often sitting on power poles. They have adapted to the human activity around them. Even a photo of wild creature in a city can still be natural by that definition. Photography by its very nature is looking at the world around us and cropping away all the things we don’t want to see in a photo to focus on what we do want to see. So yes I’m a big fan of cropping! See?! I think we don’t see things all that different. I love photography! I cherish wild animals, but I find great joy in taking picture of my pets as well as nature motifs. And if the conditions are right – even portraits! There’s a lot to love about photography that keeps drawing us back. The search for beauty is compelling. I totally agree it’s a great hobby. Nothing else compares. If it were easy I for one would not be interested. So true. When we get something good, it truly is worth something! I understand the quandary you are in, and try to think the best of people until proven otherwise. Hang in there and enjoy! I appreciate your positive spirit and it is a good idea to think the best of people first. I may just have encountered too many “proven otherwise” recently so it colours my perspective.